A conference and exhibition will be held in Tripoli in June for the pharmaceutical manufacturing sector (Photo: Ministry of Health). 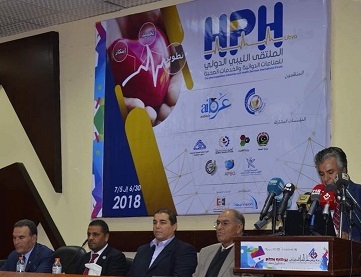 The Libyan International Pharmaceutical Manufacturing Forum will be held at the Tripoli Fairgrounds from 30 June to 5 July 2018, the Preparatory Committee announced yesterday. The event is supported by the Faiez Serraj-led Presidency Council’s Ministry of Health. At the Tripoli press conference announcing the event, the Preparatory Committee lamented the damage and looting suffered by the two state-owned pharmaceutical factories at Rabta and Maya since the 2011 revolution. They called on all the relevant Libyan authorities to cooperate in relaunching the Libyan pharmaceutical manufacturing sector and asserted that by holding this event in Libya it would boost the sector by establishing a foundation for other related subsectors to build upon. The organizers also hoped that the event would help the transfer of know-how into Libya. All the schools of medicine will participate in the event as well as the holding of workshops with local and international experts through video links.